You been asking for it and now we finally have it…Orgreenic 12″ Frying Pan. Many of you already have the 10″ pan and now how wonderful the Orgreenic pans are. Now with the 12″ pan you can do even more healthy cooking! 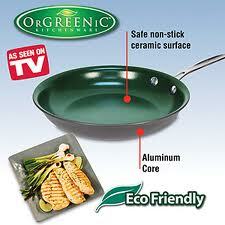 Orgreenic pans are made from aluminum with a non-stick ceramic surface that will not chip! We absolutely love Orgreenic here at As Seen on TV Web Store, cooking has never been so easy and it’s healthy! With super easy clean up! Doesn’t get much better than that. Click here to get your Orgreenic 12″ Pan today!